Follow the live text from Man Utd v Man City. Thanks for joining us today on a day of more derby glee for Sunderland and woe for Newcastle. You can follow the Manchester derby here or Bournemouth v Tottenham here. We were the better side by a distance. We controlled it, created chances and never looked like giving away anything at the back. Even with 10 men in the second half we still controlled it. Referee decisions are out of your control. The defining moments were two ref decision he got wrong. Gini Wijnaldum's ball was handballed by Lee Cattermole and the penalty for them was never a penalty. The penalty and red card was a double whammy. In the first half the team were excellent. I was totally relaxed. We were in control. I said to players that’s what we must continue. If we continue doing that and get decisions right then we’ll do OK.
"It was never a penalty. Absolutely ridiculous," Magpies boss Steve McClaren tells BBC Sport. Newcastle boss Steve McClaren has turned up to face the media now. We'll bring you his reaction shortly. Newcastle went down to 10 men when Fabricio Coloccini fouled Steven Fletcher, with Adam Johnson scoring the resulting penalty. But, despite benefiting, Black Cats boss Sam Allardyce would like to see the rules changed so a player wouldn't be sent off on top of conceding a penalty. "It’s the rules sadly. I think a penalty is enough," he told BBC Sport. "I think the referees think the same but the governing body say it has to be a red. It’s a foul and a penalty – that’s enough for us. 11 v 11 is what we want to keep the entertainment level up. I’m sure our fans wouldn’t agree but as a football man I’d like to see the rule changed." Sunderland boss Sam Allardyce told BBC Sport: "We’ve carried that precious piece of history on – the fourth manager to beat Newcastle in their second game as Sunderland boss. "This was quite an achievement considering the low ebb we're in at the moment - facing a rival with the extra pressure of having won the last five derbies. "Everyone’s done a job – the players on the pitch and me, tactically setting them out. We had some good fortune for the first goal and we took advantage of it. It’s the first good weekend the fans have had this season. "It’s a big victory and we can all look forward to next week. Hopefully this is the start of us getting out of trouble." Sam Allardyce becomes the fourth Sunderland manager in a row to face Newcastle in their second game in charge, with all of them winning. Luke Stovell: We may have let in two sloppy goals but at least McLaren still went attacking after we went to 10 men. Callum Hogg: Game utterly ruined by an atrocious refereeing performance. Anthony Rhodes: 10 games played, three ruined by red cards. Newcastle not played badly going forward this season. Kamikaze defending remain. Sunderland become the first team to ever win six Tyne-Wear/Wear-Tyne derbies in a row. It was a bit of a smash and grab - but Newcastle have themselves to blame to some extent for failing to take their chances. Ayoze Perez controls the ball onto his hand in the box and that will probably be the last action. John Dykes: Newcastle will be seriously ruing using up all their goals last weekend. Ben Turner: People criticising Sunderland need to remember this is an Allardyce set-up, not pretty football but devastatingly effective. Rob Ward: You just described Sunderland's third goal as total football. Well. Sunderland have had three shots on target - Newcastle have had eight. Florian Thauvin tries a scissors kick but instead of the ball he accidentally meets Billy Jones's head. No foul given though. We're into four minutes added on. That third goal takes Sunderland above Newcastle on goal difference. This is total football from Sunderland - a fantastic passing move! The Black Cats counter as Younes Kaboul (that is not a typo) plays a brilliant ball into the box which Steven Fletcher volleys home! On this performance Newcastle will be fine, however Sunderland are going down. How can a team with 10 men still outplay a team with 11? Newcastle haven't played badly today at all - they were the better team until it all went wrong in the 45th minute. But if they've failed to score with their first 20 efforts, it's hard to see them scoring twice in the remaining six minutes. That's all the substitutions made for this game as Jeremain Lens is replaced by Seb Larsson in the Sunderland midfield. Sebastian Coates heads Moussa Sissoko's deep ball out for a corner. It ends with Florian Thauvin dragging a shot wide from the edge of the box, having earlier had an effort blocked. I'll have make sure I'm not carrying anything when I see Geordie friends next week as I'll the fingers of both hands for taunting purposes! Yes Newcastle are probably going to lose this now. But they have still had more possession, twice as many shots and four times as many on target. Ignore this result and take what has been an impressive if very unlucky performance going forward. Red card is subjective but people saying it wasn't a foul simply don't know the laws of the game I'm afraid. Newcastle bring off full-back Paul Dummett for skillful attacking midfielder Florian Thauvin. He's got 10 minutes to turn this one around. Daryl Janmaat crosses, Aleksandar Mitrovic heads wide from close range. Maybe you'd expect more from a big-money striker. This has not been Newcastle's day. A corner is cleared only as far as Newcastle midfielder Vurnon Anita, but he pokes it well over under not much pressure. Hideous effort by the substitute. Sunderland winger Adam Johnson hits the crossbar with a curling 20-yard effort after cutting inside from the right. Fantastic effort from the former Middlesbrough player, who scored today's opener. From the corner, Pantilimon flaps and Ayoze Perez blazes wide. If Sunderland score one more goal, they'll overtake Newcastle on goal difference into 18th. A colleague said to me earlier if every Sunderland match was a derby, they'd win the Premier League. This must be a worrying time to be a Magpies fan. From the corner, Yann M'Vila takes a volley across goal and Billy Jonesturns it in at the far post from maybe a yard out. That's the defender's first goal for Sunderland and surely that's their sixth derby win in a row - a record for either side. Corner to Sunderland as Steven Fletcher's effort from 25 yards cannons off the shoulder of a Newcastle defender. Not related to Sunderland's controversial penalty, but we couldn't ignore this tweet from West Ham and Ann Summers' chairman. The referee could have done himself a huge favour if he gave Coloccini a yellow card. Yes I would say it is a penalty. However, a red card has to be denying a clear goalscoring opportunity. The fact that we are debating whether Fletcher would have got to the ball tells us it can not of been a clear goalscoring opportunity. Decision should of been: penalty and yellow card. Whilst everyone is uming and ahhing over the penalty and red card, Newcastle fans will also be miffed that a clear arm across the face and therefore a penalty in the Sunderland box directly before the incident was ignored. Great chance for Newcastle striker Aleksandar Mitrovic to equalise. The Serb cuts the ball onto his right foot, sending the defender sliding to the ground, but Costel Pantilimon keeps out his shot with a good save. Moments later the keeper again saves a low effort from Ayoze Perez. Newcastle haven't given this one up at all. Football needs its version of rugby's TMO. That was a poor decision and it had ruined the game, foul no, red no, bring in TMO. On rugby world cup semi final weekend, what about a sin bin for football? Would reduce severity of technical but soft fouls and also prevent silly double yellows. Maybe a hockey green (caution), yellow (sin bin for Coloccini), red (off) system? I've been advocating it for years. This ref is too young and too inexperienced to officiate this particular fixture. Going to be an interest second half for him. So Jack Colback injured, Fabricio Coloccini suspended and Newcastle in the relegation zone - this game isn't going great for them, is it? That is the end of Jack Colback's day - Vernon Anita replaces him in midfield. Both sides have one change left to make. Jack Colback limps off and the game gets back under way. Lee Cattermole has absolutely crunched Jack Colback in a tackle there seconds into the second half. The ex-Sunderland midfielder looks in pain. It looks like Colback's ankle was trapped under Cattermole's leg there when he was sliding in. The rules say that charging is only legal if the player charging is "within playing distance of the ball" and "without using arms or elbows" Coloccini could not have reached the ball and used his arm therefore a foul on two counts. Whether it was an obvious goal scoring opportunity is less clear cut. Well done referee for not bottling that decision. There's a difference between challenging for the ball, and obstruction. Coloccini was never getting to the ball and wasn't challenging for it. Correct call! As a neutral unbelievable decision by the referee can't see how he gives the penalty and red card coloccini uses his strength to get fletcher out of it! Newcastle get us under way in the second half. Newcastle bring on defender Jamaal Lascelles for midfielder Cheick Tiote at half-time. Tiote was definitely going to get sent off so not the worst decision. This is the most shots Newcastle have had in the first half of a Premier League game since September 2014 v Hull (also 12). Players are coming back out now. OneMoreWicket: Fletcher had a chance to get the ball, such a tough decision for the ref. Doron Klemer: A neutral's opinion is a shoulder charge but not going for the ball, 50/50. Goalie probably covering, but another 50/50 call on red. Matt Griffiths: Why no comments about the dissent shown yet again by footballers? The decision may be wrong, but why abuse officials. Newcastle had 68% of the possession in that half - and 12 shots to Sunderland's three. But the red card (as well as the goal) has really changed the dynamic of this game now. What about Jose Mourinho's future at Chelsea? Former Liverpool midfielder Danny Murphy: "He is overly paranoid. Some of it is clever deflection. I actually think Chelsea have had some bad luck but that is normal for a club at times and I would like to see more humility from him. "Jose Mourinho has earned the right for one bad season. Of course, you can moan at referees but not every week. Are Chelsea looking to do the same thing by winning a trophy, having a bad spell and getting rid of the manager or do they want stability? Former Wigan striker Jason Roberts: "Last season we were talking about a dynasty at Chelsea and now 10 games into this season there is talk about getting rid of the manager. But who do you get to replace him?" Daily Telegraph journalist Jason Burt: "I'm not sure this can go on for much longer. It's reached stage now where a decision has to be made. Chelsea manager Jose Mourinho has tried every single trick in the book. I've never seen him like this, struggling to turn things around. "I can't see who he can blame for what has gone wrong. If Chelsea believe they are not competitive anymore, ie. they can't finish in top four, they will make the change." Daniel Woodley: Spot on from the referee. No need for Coloccini to barge into Fletcher. Last man so red card. Referee should be applauded. Jamie Sheehan: It's not the ref's job to keep 11v11. It's the players. Denial of goalscoring opportunity is a red. Corin Wright: Fletcher wasn't reaching that. Penalty, yes. Red card, No. Newcastle have had 10 red cards since the start of last season - three more than any other side. Adam Johnson is now Sunderland's joint top-scorer in Premier League derbies against Newcastle (4, level with Kevin Phillips). Lewis Starks: Stupid by Coloccini but never a red. "Clear goal scoring opportunity"? Nope. And why hasn't McClaren been sent to the stands? Serge Tchwenko: Absolute joke of a ref. If that's his definition of a red card offense, we might as well pack it in and stop playing. Gareth Gallagher: Softest penalty and red card I ever did see. So what happened there was Jermain Defoe played a through ball to Steven Fletcher, who ran onto it. Fabricio Coloccini ran across to just shepherd the ball back to keeper Rob Elliot with the Sunderland striker going down. No different to seeing the ball out of play for a goal-kick as so many defenders do so many times. And now it's an entirely different game. Theo Bowyer: Not a red. Not a foul. Horrendous call from the ref. Charles Kahanji: Not a penalty, not a sending off. Goalkeeper had that covered. Thomas Goodchild: Shoulder to shoulder. Someone fire that ref. That is abysmal. Tweet us using #bbcfootball, text 81111 or leave a message on the BBC Match of the Day Facebook page. Quote Message: From my perspective that game has been ruined by a decision that did not have to be made. Come on, it’s not right. That is not a sending off. From my perspective that game has been ruined by a decision that did not have to be made. Come on, it’s not right. That is not a sending off. It looks like Newcastle manager Steve McClaren told referee Robert Madley "you got it wrong", quite calmly I must say, as they went down the tunnel. I cannot believe that. Newcastle have dominated that half entirely but Sunderland lead - and are now up against 10 men. Keeper Rob Elliot goes the right way but Adam Johnson finds the corner with a great kick. He then runs all the way down the pitch to celebrate with Sunderland's fans. Even harsher! Fabricio Coloccini has been sent off. He can't believe it. Neither can Steve McClaren. Neither can I! Fabricio Coloccini blocks off a Steven Fletcher run and the referee gives a penalty. Very harsh. If your going to have a manager they've got to have full control, seems to me that Tim Sherwood could never have succeeded. Don't think the next guy will either. Big changes needed if Villa are to thrive again. Danny Murphy needs to realise no 'top' manager is ever going to go to a club in a relegation battle. Mores the pity, then we would see how good they really are. I cannot believe people are trying to defend Sherwood. His record is appalling, he lacks experience and his tactics are abysmal. It was a big ego trip that has gone dramatically wrong for him. Everyone needs to get real. Moments later the Toon win a free-kick in a better position and Costel Pantilimon tips Georginio Wijnaldum's effort over. Sunderland midfielder Lee Clattermole - now wearing the captain's armband following John O'Shea's injury, brings Ayoze Perez down with a high boot. Free-kick given but it comes to nothing. Newcastle have been brilliant in this opening 30 mins. We will still probably find a way to lose. That John O'Shea injury could be bad news for the Republic of Ireland, who face Bosnia in a two-legged Euro 2016 play-off in mid-November. During the week Jermain Defoe told the Journal: "At the age of 33, you want to play football. I didn't come here to sit on the bench. You want to play football and score goals. I said that from day one." He got a great reception from the home fans when he came on. Oh oh. Seconds after the change, John O'Shea pulls up. He appears to have just himself while playing a backpass. And he's now replaced by Sebastian Coates. Two changes within two minutes. It's Jermain Defoe coming on. Sunderland needed to change something to turn the tide of this game, injury or not. Ayoze Perez dives for Moussa Sissoko's cross but if anything his touch takes it away from the danger zone. Rian Hoskins: From what it seemed, Sherwood had a big say in transfers at Villa but clearly couldn't control who they would sell. Jay Osman: Sherwood wasn't to know when he promised the AV chairman they'll only be four places behind Chelsea after 10 games. Dom Marsh: Unfortunately I can see it being Brendan Rodgers. Would prefer David Moyes if possible. Whoever it is I can't see where the points are coming. Is Villa's recruitment structure to blame? Quote Message: If you want good quality managers, you're going to have to change the structure. That's the problem Villa will have. If things stay the same in terms of recruitment, the top manager are never going to go. If you want good quality managers, you're going to have to change the structure. That's the problem Villa will have. If things stay the same in terms of recruitment, the top manager are never going to go. This must be as well as Newcastle have played in a derby for some time - Ayoze Perez finds Jack Colback over the top but keeper Costel Pantilimon saves again. And from the corner Aleksandar Mitrovic pokes it wide. "Villa Park is a tough place for the home side. Visiting managers say keep the crowd quiet for the first 20 minutes and they will turn. That has not just been the case for Tim Sherwood, but any manager. Who can realistically come in and turn it round? But when you go there it's a big club." Moussa Sissoko has a go from outside the box for Newcastle but it's pretty weak and rolls into the arms of Costel Pantilimon. They've had six shots to Sunderland's one. John in Islington: Dear chairmen of the Premier League, please stop sacking managers the week before they play Spurs! Expect Villa players to actually turn up and fight next week at White Hart Lane a la Liverpool last week. Thanks, a Tottenham fan. Quote Message: They could have got a draw out of the game. It wasn't that game in isolation. It was the games before. Sometimes it's how you lose. As soon as Swansea got the equaliser, the confidence drained out of them. They could have got a draw out of the game. It wasn't that game in isolation. It was the games before. Sometimes it's how you lose. As soon as Swansea got the equaliser, the confidence drained out of them. Appointed in February, Tim Sherwood reached the FA Cup final and led the club to a 17th-placed finish in his first season in charge, but has won one of 10 league matches this term. Villa have not won since the opening day and are four points from safety. Sherwood has overseen just 28 games in all competitions - the shortest spell of any permanent Villa manager. Quote Message: I actually think he did well keeping them up. He deserves credit for that. That question mark for me would be the recruitment of the players that have come in. Too many of them haven't been good enough. I actually think he did well keeping them up. He deserves credit for that. That question mark for me would be the recruitment of the players that have come in. Too many of them haven't been good enough. Former Sunderland midfielder Jack Colback has a shot but Aleksandar Mitrovic deflects it wide. The Serb was offside anyway so it didn't matter where it went. Scott Wilcox: Rodgers: Lost two best players, sacked. Sherwood: Lost two best players, sacked. Learn to not sell your best players. Lee Shore: Rodgers to Villa is a gimme. Good coach, Premier League experience & if relegation is unavoidable, championship experience too. Tim Mann: I just don't see how Villa can justify Sherwood sacking? Big error in my mind! Hope they go down now, club's gone stale! Georginio Wijnaldum plays a one-two with Aleksandar Mitrovic and forces a save down low from Costel Pantilimon. The Dutch midfielder must be in the confidence of his life after scoring four against Norwich last weekend. The fouling king Cheick Tiote comes in with a late challenge on Adam Johnson but escapes with a warning. What a man - seconds later, before I can even finish that entry, he takes Yann M'Vila out of the equation and is shown a yellow card. Ridiculous. Short odds on him being sent off now I'd guess. Matt Price: I think that's Aston Villa relegated in all honesty: no fight, no drive, no manager, nowt. Steve: Sherwood doesn't have the skills yet to change things round at Villa. The club need a miracle worker, he is not one. Desmond Oguda: I am surprised Gary Lineker calls Sherwood's sacking "an insanity"... I think it was the most sane thing to do now. Aleksandar Mitrovic flicks a header wide of the far post for Newcastle, Sunderland haven't gotten into this game at all. Over at the Stadium of Light, Newcastle have had the best of the opening 10 minutes - with 72% possession. Jack Colback plays a ball straight out for a goal-kick to whistles from the home crowd, who don't like him too much after he swapped red and white for black and white. Michael Mada: Villa are a more poisoned chalice than Sunderland. Get a good contract for a few months, then get out there. Ted Tayler: Sherwood is a decent bloke. Villa are a club in freefall. As a lifelong Bluenose I'm smiling like a Cheshire Cat! David M. Gullever: I’m a Sherwood fan (still grateful for the great work at Spurs) – great young manager (bad decision AV) – see you soon again Tim. I was discussing with a colleague the other day that Villa would surely be a great club to take over for a rich businessman? Based in England's second city - in the middle of the country - with a good fanbase and a strong history. Not to mention a famous ground. No reason they couldn't emulate, say, Chelsea or Manchester City, surely? Aston Villa have now confirmed the news. "However, the club would like to place on record its sincere thanks to Tim for all his efforts during a difficult period last season. We wish him well in the future. Sally Smith: What is the higher life expectancy these days - a mayfly or a Premier League manager? Simon Paice: 'Tactical Tim' has gone from Villa. No surprises really. Average signings, no fight in his side and poor tactics all round. Alex Jeffers: I do feel sorry for Sherwood, not even a cup final could save a relegation threatened club? Seems very short-sighted. Newcastle captain Fabricio Coloccini has the first chance of the game. Aleksandar Mitrovic flicks on a free-kick to the defender, but his flying volley is touched around the post by Costel Pantilimon. A couple of early tackles flying in - classic derby fare. Three free-kicks for Newcastle within 90 seconds. Under way at Stadium of Light. Can Sunderland make it five wins in a row. A reminder of today's line-ups. Players ready, almost time to go. We have to make sure we play the game and not the occasion. We don't pay attention to the table or previous results - what we do have is a fresh game and a great opportunity to come away with three points. Let us know your thoughts on Tim Sherwood being sacked by Aston Villa. The right decision? Who next to replace him? Right, is there anybody (bar Villa fans) who doesn't want to see this happen? No statement from Aston Villa yet but we're now certain that Tim Sherwood has been sacked as manager after yesterday's 2-1 defeat by Swansea. We'll be bringing you reaction to that as well as Sunderland v Newcastle, which kicks off in five minutes. Tom Smith: Aspley Beacon beat Bulwell 5-3 last game of the season to stop them winning every game that year. Was like the Alamo. Kev Mac: I played for Park Bar vs Red Lion in cup semi-final and won 10-0. I scored a screamer then suffered an ACL tear. Big news at Villa Park... We're just waiting for confirmation from Villa, but BBC Sport's David Ornstein says Tim Sherwood is gone. Newcastle have conceded 19 goals in nine Premier League games and former Blackburn and Chelsea striker Chris Sutton is not impressed. “Newcastle haven’t cracked it yet and at the back they are still woeful. They lack leadership at the back,” Sutton told BBC Radio 5 live on Friday night. If this doesn't inspire Newcastle midfielder Moussa Sissoko, then nothing will. Newcastle midfielder Georginio Wijnaldum, who scored four times in last weekend's 6-2 win over Norwich, has been talking to BBC Football Focus about today's game. "All the fans I meet on the street – or in the supermarket – all talk about the game. The last five times they lost and they want to win now. They’re almost begging me to win the game. "I can see how important it is to the fans to win a derby like this. If you look at the ranking we are both at the bottom of the league. This game is important for both of us. If we win we can look up and if we lose we have to look down." Sunderland are taking a look at 29-year-old Nigeria striker Chinedu Obasi, who would be able to join immediately. He was released by Schalke in the summer after three seasons so isn't restricted by transfer windows. Black Cats boss Sam Allardyce said: "We'll make a judgement next week." Compulsive Craig: Was there so much emphasis when Newcastle won five in a row? Sure Sunderland fans think we've only played each other five times. Kyle Utterson: As a Newcastle fan I'm very nervous I expect Sunderland to be well organized. Tight game and I'm going for 1-0. Scott Wilcox: All today’s Premier League matches will be won by the away side. Controversial. Newcastle's only goal in eight hours and 57 minutes against Sunderland was scored by Mathieu Debuchy in a 2-1 defeat at the Stadium of Light two years ago. We asked what's your favourite derby moment as a player? Did you score the winner for the Cross Keys against the pub next door? Or make a last-minute penalty save for your university side against your hated rivals? 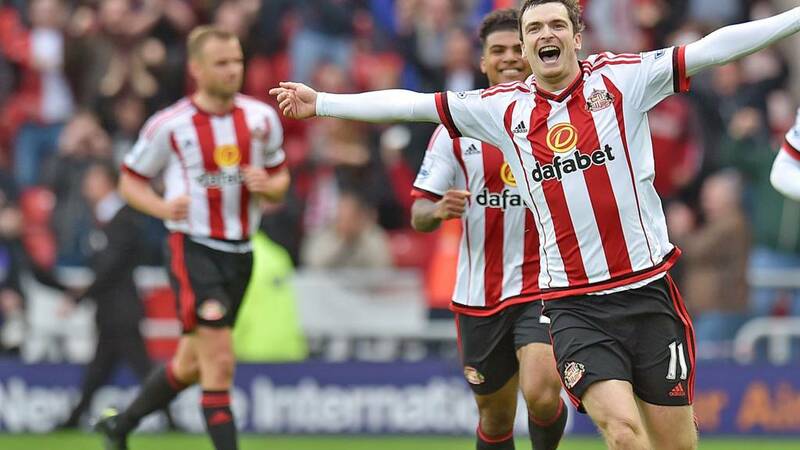 Former Sunderland and Newcastle midfielder Lee Clark has been talking to the BBC about both clubs' current struggles to attract quality players. "The difficulty for Newcastle and Sunderland is they're in relegation battles. Even when we were attracting some of the biggest names, we always knew there has to be another incentive to attract them to the North East because they had possibilities to go play and live in London. It’s always a big pull. "We were competing at the top end of the Premier League. There was a possibility of challenging for trophies. The difficulty at this moment in time for both clubs is the catchment area, where it is – and the league position of the clubs." Can Allardyce make it four? I'm just hoping that it continues to follow on this Sunday. It's got very little to do with me, it's down to fate the fact that this run carries on. Sunderland are winless in nine games in the Premier League this season, but Jermaine Jenas says that will change when they start using Jermain Defoe in his best position. "Defoe is one of the best players and I would put him as one of the best goalscorers I’ve seen and played with," said Jenas on BBC Radio 5 live on Friday night. "But he is not playing up front. They have chucked him on the left wing. Keith in Hertfordshire: Last season we lost the first 5 opening games. We then played top of the league. 3-0 down at half time we came back to draw 3-3 with myself scoring the equalising goal. We then won every game for the rest of the season (except one loss) and finished second in the league gaining promotion. The best season of football I've ever been a part of. Fancy yourself as a bit of a mystic meg? Prove it then by predicting the scores for all today's games. Read more of Lawro's thoughts on this and the rest of today's games by clicking on this link. There will be live text on this game coming up later on a different page on the BBC Sport website/app. Sunderland boss Sam Allardyce told BBC Sport: "It's probably the most nervous game you face in the entire season. "Sunderland have an epic recent record. I have to try and keep that up. "Anybody in football must have ambition. Eventually you realise the level. Opportunity is rarer for English coaches. Our game has grown in the last 15 or 20 years because we are the biggest brand. "We must aim higher than just staying up. But we need to go inch by inch and point by point to make sure Sunderland do better each year." Eugene de Rastignac: My best derby was against the team of my best friend, he was a goalkeeper and me a striker, we won 6-1. Sunderland Echo reporter Chris Young gives an indication of the frosty reception that Newcastle midfielder Jack Colback is set to get at the home of his former club. "How to summarise the importance of this game to both teams? 'Crucial' barely seems to scratch the surface. "Sam Allardyce, the only man ever to manage both clubs, is eager not to be the first Sunderland manager to lose to Newcastle since Steve Bruce. "Steve McClaren is so pre-occupied that he wrote an open letter to the Newcastle faithful calling their run of derby defeats 'unbearable'. "The truth may be that both clubs have been hamstrung in recent years by their clinical obsession with each other." Sunderland make three switches from the 1-0 defeat by West Brom. In come Jeremain Lens, Ola Toivonen and Adam Johnson. Out go Seb Larsson, Jordi Gomez and Fabio Borini, who has a knock. Unsurprisingly Newcastle don't make any changes from the side who beat Norwich 6-2 last weekend. Four-goal Georginio Wijnaldum keeps his place. Sunderland: Pantilimon, Yedlin, O'Shea, Kaboul, Jones, Cattermole, M'Vila, Lens, Toivonen, Johnson, Fletcher. Subs: Van Aanholt, Larsson, Gomez, Defoe, Coates, Mannone, Watmore. Newcastle: Elliot, Janmaat, Mbemba, Coloccini, Dummett, Sissoko, Tiote, Colback, Wijnaldum, Perez, Mitrovic. Subs: Anita, Cisse, De Jong, Lascelles, Haidara, Thauvin, Woodman. Former Chelsea midfielder Gus Poyet has defended manager Jose Mourinho. "It's not the problem of any one person," the former Sunderland boss told BBC Radio 5 live's Sportsweek. "You cannot take all praise when you win and you can't be criticised for everything when you lose. "Normally in England unfortunately we go for the head of the manager, but, if you haven't been on the touchline, you don't know how you feel in certain situations. We only look at the bad things. "I do like Mourinho and I have no doubt he will keep his job." Soon, we'll turn our attentions to Sunderland v Newcastle. They should announce their line-ups in about 10 minutes. Not a great omen for Chelsea fans. Are they facing a season out of the Champions League? Let us know the names of the teams involved in your games! My favourite derby moment as a supporter was when Oxford beat Swindon 2-0 despite having top scorer James Constable sent off after 10 minutes. Swindon's Matt Ritchie, now of Premier League and Scotland fame, was booked for shoving a ball-boy. Sorry to remind you of that game Swindon fans. We want to know your great derby moments as a player. Keep them coming. BBC Radio 5 live's Sportsweek had Chelsea Supporters' Trust chairman Tim Rolls on this morning. "The manager is obviously not happy but Nemanja Matic, Eden Hazard and Diego Costa are not performing to the same level. The cause of this I don’t know. I don’t think it is complacency. "The problem was it happened right at the start of the season. It started very poorly and continued. "There are a few hotheads on social media. There is a bit of growling about the performances but there is no groundswell of people wanting him out at all." This is actually the worst ever start to a title defence since the Premier League was formed in 1992-93. Chelsea edge Blackburn on goal difference - it's a full six points to the next worst (David Moyes's Manchester United). Chelsea legend Ron Harris has been speaking to BBC Radio 5 live's Sportsweek. "This time last season they had one of the best defensive records in the Premier League. This season they are leaking goals. That is the biggest concern. "I don’t think Jose has allowed them to be complacent but one or two players are having a poor time. "They have had one or two poor decisions go against them. It is natural people get irate. Maybe Jose sits down and thinks he could have done things in a different manner but that is the way he is. "It is only like you driving to work and someone cuts you up. You react. "Let's be fair, if you look at his record, you don’t become a bad manager in 10 games. I have not seen too many Chelsea supporters moaning and groaning. They are disappointed with results but I am sure Jose will turn it around." Chelsea defender Gary Cahill told BBC Sport: "[The mood in the dressing room] is not great - like you’d imagine when you lose games. Last season we weren’t used to it. The lads are devastated. "You’re left scratching your head sometimes. In the first half the Cesc Fabregas goal could have been given and we had the goal that was nearly over the line. That sums up the way we’re going. "And then we’ve got the sending off. Originally we played on – we thought the referee had played on. Maybe the assistant called it back, I’m not sure sure what’s happened there. We’ve not had the rub of the green but we’re not feeling sorry for ourselves. We have to work hard to turn this round. "Not many words are being said at the moment. I’m sure we’ll reflect in next day or so. We worked really hard at 10 men and had the majority of the play in the second half. It’s a summary of our season at the minute." No doubt about the big story of the weekend so far. Chelsea lost again - this time in the derby with West Ham - and even worse Jose Mourinho was sent off for being an angry man. In fact Mourinho was so wound-up he refused to do an interview afterwards, and didn't send out any coaches in his stead (one of his coaches was also sent off). What's your favourite derby moment as a player? Did you score the winner for the Cross Keys against the pub next door? Use the hashtag #getinspired or have your say on the BBC Sport Facebook pages. So what do we have on the derby smorgasbord today? First up it's Sunderland v Newcastle (12:00 GMT). And then it's Manchester United v City at 14:05. And across Europe there are derbies in Vienna, Prague, Athens, Lisbon, Moscow and Istanbul. We will turn our attention to the Wear-Tyne derby (apparently that's a thing because Sunderland are at home) at 11:00 but first a bit of general football chat for you. Derby day. You've got to love it. League games where the result stands alone - a big or dramatic win will be remembered for years to come, when league positions have been long forgotten. There are those who say it's only another three points - but everyone knows that isn't really true. So get yourself settled in for an intense day of football.